Are people using your curb as an extra parking space? Use curb parking signs to prevent illegal parking on curbs or blocking driveways. Great in areas where drivers use the curb to parallel park. • Offered in a variety of shapes and designs. Take your pick! 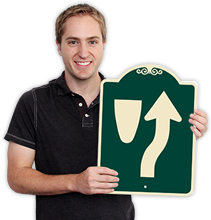 • SignatureSigns™ have a designer appeal that matches the décor in hotels, apartments, and plush offices. • And, customize your signs for free. Add text and protect your property from illegitimate parking.